All of our orangeries are individually designed to meet the client’s requirements and fit their particular location. They can vary from traditional to the ultra-modern. We use CAD (Computer Aided Design) to produce realistic representations of the finished orangery, allowing the client to choose between several orangery designs and even guide us in the design process. The materials used are typically hardwood and aluminium, but for some designs uPVC can be the most suitable. The proportions of masonry and glazing used will vary, but there is usually less glass in an orangery than a conservatory. The key design feature of an orangery is usuallythe glazed lantern set within an area of “solid” roof. Typically this flat perimeter is around 600mm wide internally, however its width can be adjusted to suite the client’s preferences. Often this area will feature recessed spotlights internally and have a plastered finish, however timber paneling can be used. In most cases, it is our view that the height of this “ceiling area” should match the ceiling level of the ground floor of the main building, which in many cases is 2.4m (8″) from floor level. It is also normally desirable for the tops of the windows and doors of the orangery to be at the same height as those in the main house, which are typically 2.1m (7″) high. In this scenario there a difference of 0.3m between the tops of the windows and doors and the ceiling. This space can either be filled with masonry, an additional row of glazing, otherwise the windows and doors can be made higher so they meet the ceiling, but may note then align with those on the main building. Where an opening is created between the new and existing buildings, we would normally bury the supporting steel beam within the ceiling void so the new and existing ceilings run through flush. This will often mean re-skimming the existing ceiling, but the end result is well worth it. Internally the glazed roof is the focal point of the room. The traditional lantern roof will often be rectangular in plan view and hipped at both ends. However many other shapes and styles are available for the customer with more avant-garde tastes. Depending on the height available, there may be a row of clerestory windows between the lantern and the flat roof area. Automated openings are available, are are the latest types of glass such as self-cleaning, solar-control and low-e. The external vertical faces of the orangery roof area often feature a decorative timber fascia. We have a standard range of fascia designs but can produce bespoke fascias to suit any existing features on the property. They tend to be based around three main styles. In some situations the orangery will work best with no timber fascia, but a brick parapet built up above roof level. This might be the case if the main building has particularly attractive brickwork, or if the orangery is to be built against a party boundary where maintenance would be difficult. We will often incorporate some type of detail into the brickwork design, such as creasing tiles with a brick-on-edge. 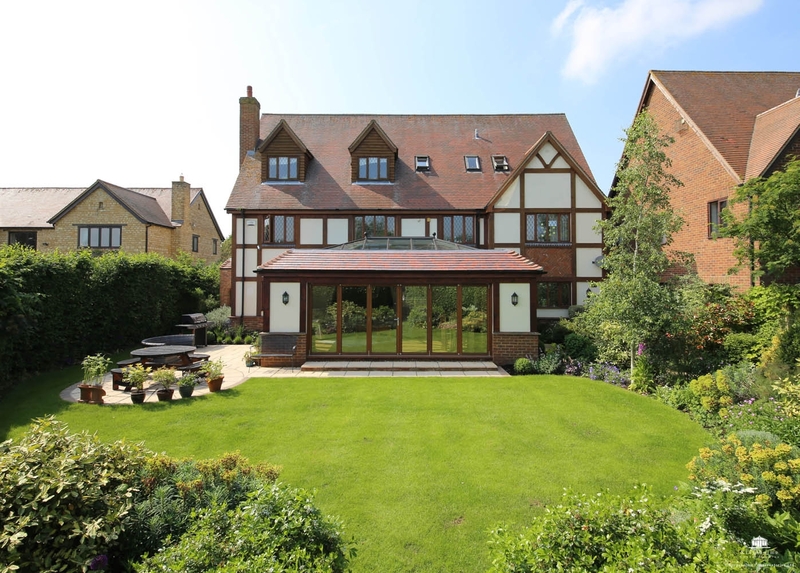 As an alternative to a timber fascia or a brick parapet, we can construct a section of pitched roof, with tiles to match the house around the perimeter of the orangery. This can help the new room blend in seamlessly with the original building. This may often mean the lantern is not visible from the outside.